Organizations like the National Coalition to End Domestic Violence when testifying at public hearings or applying for funding say they help everyone, including men. Really? We sent $50 plus freight to the National Coalition Against Domestic Violence for a copy of National Directory of Domestic Violence Programs, 30 Years of Working to Keep Women and Children Safe, 2008 Edition (hereafter “Directory”). 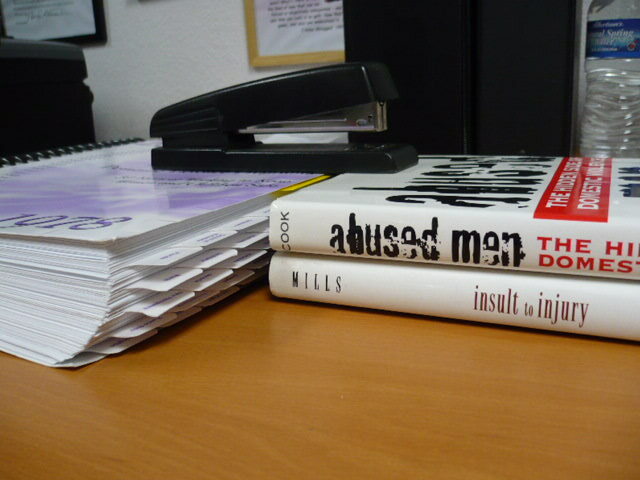 The 4.04 pound bulky behemoth is roughly 450 pages spiral-bound with each page listing information about four domestic violence service provider organizations, about 2,000 organizations total. It’s as thick as the combined thickness of Phil Cook’s Abused Men – The Hidden Side of Domestic Violence and Linda Mill’s Insult to Injury. The National Coalition For Men has for years been referring men and women in need of related assistance to various service providers so the Directory is a useful tool. Unfortunately, the Directory is about programs for women and children. Males are clearly an afterthought and, depending upon age, many programs listed in the Directory deny services to male children. Some providers even offer a “Shelter/Safehouse for Pets”. There is no “Shelter/Safehouse” for men. After the introduction comes “Definitions…” for categories like “Shelter, Safehouse, Crisis Counseling, Non-resident Counseling, Family Counseling, Parenting Skill Training, Childcare During Groups (Program provides childcare for the children of battered women while their mothers attend support groups), Daycare, Batterer Counseling,” and 24 more “Definitions” for the various services offered, 35 categories in total. Advertisers have a section after Definitions. The McGraw-Hill Companies is the first. “The McGraw-Hill Companies Against Domestic Violence Initiative for Networking and Success supports the mission of the National Coalition Against Domestic Violence.” Someday someone will research how many Women Studies graduates work at The McGraw-Hill Companies as editors. Don’t you want to know? The National Association of Men and Women Committed to Ending Violence Against Women, A CALL TO MEN, is advertised as a leading men’s organization addressing mens violence against women—all forms of violence against women. There’s a picture of 13 serious looking guys of various ages and ethnicity dressed in white – the good-guys I guess. It appears this group is little concerned about one of their members being murdered in his sleep by his wife. The Washington State Coalition Against Domestic Violence advertises five different revolutionary, interactive, and easy to use “Living with Domestic Violence” training programs, complete with teaching guides. I always thought one was suppose to leave an abusive situation rather than live with it. Better perhaps would be programs designed to help us live without the Domestic Violence Industry. There’s a Master’s program on domestic violence offered by the University of Colorado at Denver. No need for such programs without industries to hire graduates, primarily soft go-to-meetings jobs for women. Connie Elder International sells skin care, shapeware, and intimates. Connie decided to leave an abusive marriage and parlayed her freedom into offices in Nashville, London, and Philadelphia. Her “wake-up call” came when activating her home security alarm. The revelation told her the only person she was afraid of was locked inside herself. Escape is never easy. There are similar ads from The Silent Witnesses of Rhode Island, Omega Phi Beta Sorority, Joyce H. Williams Center, 1-800-Charity Cars, and Intermedia Educational DVDs & Videos. My favorite Orwellian advertiser is Victim Information and Notification Everyday (VINE). VINE is in “thousands” of communities nationwide. It lives somewhere in most major metropolitan areas and over half of the prisons in America. With this handy tool you can locate an offender by logging on to www.vinelink.com . Be careful, VINE may be growing in a neighborhood near you. Males are not much more than an afterthought. There is a place to list the “Age limit for males” though it is not in the Definitions section or a service category. One finds it in the section with the organizations address, telephone numbers, hours of operation, and other general information. One service provider turns away all male children over the age of five. Apparently they consider any male six or older a threat. 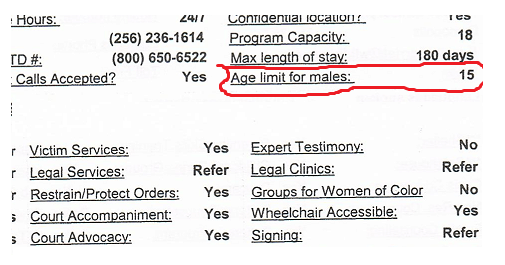 Otherwise, the lowest maximum age I found in the “Age limit for males” was 11, the highest 18. In many instances Age-limit-for-males was left blank or the entry was “None”. I found no explanation for “None.” It could be that an organization so noted accepts males of any age. Or, it could be they don’t accept males regardless of age. It could also be that they don’t want to implicate themselves one way or another. There is no age limit category for females. Many shelter providers will not accept males over the age of 12 so it is heartening to see a few programs that profess to serve male children or young adults up to age 18. However, there’s no way to tell from the Directory if shelter services are provided to males or males receive services for something else, like family or child counseling, peer support, crisis intervention, health services, sexual assault services, and so forth. There is a “Special Population Served” category, basically to show which “underserved populations” are served. For example, the Chicago Abused Women Coalition, like many other organizations, serves “African Americans, Asian, Asian Pacific Islanders, Deaf, Disabled, Gay/Lesbian/Bi/Trans, Hispanic, Immigrant, Low Income, Native-American.” Nowhere in the Directory did I find “Heterosexual Male”, the largest underserved population. Most people don’t have a clue, they really don’t. They have absolutely no understanding of how intrusive the Domestic Violence Industry is in our lives. They don’t know how DV Industry operatives have interjected their ideology into virtually all aspects of our society from pre-school to prayer groups, prisons to playgrounds, publishers to pundits… If you doubt that, pay the $50 plus freight for the “Directory”. Similarly, if you believe men are not discriminated against, there’s no war against men, men are not treated as disposables, order two copies and give one to a friend who thinks like you do. Education is the key to freedom. You and your friend are brainwashed. A good companion reader is the 209 page Guide to Feminist Organizations — all well-funded with paid staffs. Depending upon how one looks at it, a similar guide for men’s organizations, if there was such a thing, could be written on a sheet of toilet paper. For abused males it really is insult to injury. Its like you learn my thoughts! You seem to grasp so much about this, like you wrote the book in it or something. I believe that you just could do with a few % to force the message house a little bit, but instead of that, this is wonderful blog. A great read. I’ll certainly be back. I don't know, when my wife hits me, I hit her back. If she want's to (this is how my relatives, and hers actually (because they actually all agree with what I do) say it), act like a man, treat her like a man. What about little children? Women's domestic violence against men and children is grossly under reported, while child and male victims are still routinely being ignored by the taxpayer funded domestic violence industry. According to the U.S. Dept of Health and Human Services and DOJ statistics, more kids are killed by neglect and abuse in a year (1,760 in 2007), than all the female intimate partner homicides in a year. Mothers are the single largest group of kid killers, according to HHS and they have a rate twice that of fathers. Nowhere near the money is spent to protect kids from kid killing mothers as is spent by the domestic violence industry to protect women. A lot of innocent men are witch-hunted by the corrupt, gender feminist influenced, taxpayer funded, domestic violence industry. Involving the corrupt d.v. industry in an attempt to prevent abusive and neglectful deaths of children is a big mistake. No place better characterizes the corruption of the taxpayer funded, domestic violence industry than "Los Misandry." Domestic violence will never end as long as the whole truth about it is misrepresented to comply with feminist ideology. V.P. Biden recently called violence against women, "the very worst abuse." The very worst abuse is valuing one life less than another for having been born the wrong gender. Under domestic violence law, the wrong gender is men. Shelter and services are virtually non-existent for male victims of domestic violence. Options out of a bad relationship, that women have, are often not available to men. Men wind up gender profiled by the taxpayer funded, domestic violence industry, because of gender feminist ideology controlling the d.v. industry. Men are often battered by domestic violence, and then battered again by the taxpayer funded, domestic violence industry as shown in "Los Misandry" at Youtube. I feel so sorry for the American man ! I realy do ! Men are geting raped in USA and Canada and UK … but Sweden takes the Cake!!! Julian Assange will get raped by the femi – natzis there . Poor Guy !